It all started in a small Midwestern high school. He was the cute, blonde senior with a car and dimples so deep my girlfriend and I joked they were craters. I was the naive freshman who fell head over heels for him. I’m pretty sure the feeling was mutual because we were glued at the hip from that moment on. Three years later, with high school graduation looming for me, he popped the question. I was 17, he was 20. Most thought we were INSANE. But we didn’t care and we got married in 2001. I was 18, he was 21. Young, naive and foolish. Surely we would slow it down a bit now and enjoy life as a married couple before adding children. I mean, we had PLENTY of time for that later down the road, right? Uh… we just don’t do things at that pace! In 2002 we welcomed our first born. A son. Andrew Jagger, aka A.J. And in 2005 our first daughter, Madelyn JoAnna, aka Maddie Jo. You’ve probably figured out by now we kind of march to the beat of our own drum. Thank goodness too, because our little Georgia Grace came into the world in 2010. After that we thought we “should” be done. Mike had just lost his long time job as a pipe fitter and we were unsure of what was going to happen. We scheduled “the snip” and with a quick trip to his doctor and a bag or two of frozen peas we were officially closing the baby-bearing chapter in our lives at the ages of 28 and 31. God had a bigger and better plan. His name was Ezra Jude. And he was a COMPLETE. SHOCK. Like couldn’t-be-more-surprised-if-I-woke-up-with-my-head-sewn-to-the-carpet surprised. After the initial shock wore off we announced our surprise to the world. Only 1 out of every 4000 vasectomies fail (.025%)! 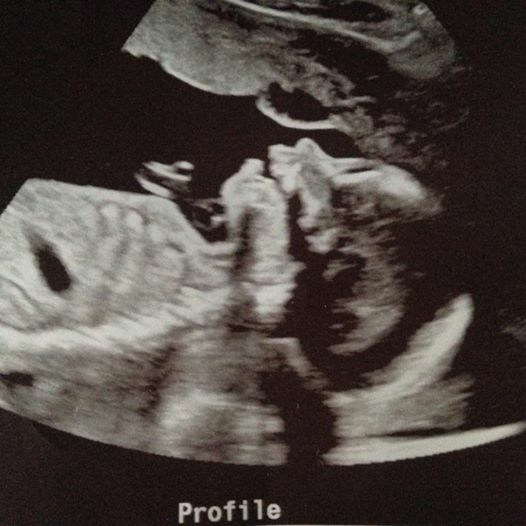 Meet Mr. 0.025%: YEP, WERE PREGNANT! And in 2012 Ezra Jude came busting through the door we thought we shut. We are so glad God re-opened it! And then Cora Nicole followed in 2014. Because His plans are bigger than ours. UPDATE: in December of 2015 we found out we were expecting our EIGHTH blessing in the form of a little boy to even our numbers: Cypress Daniel. He is due in August of 2016 and we can’t wait to meet him! So I just discovered your blog! Wow! So you conceived 3 times after the big V? We have closed the baby gate after having 8 (although if God decides to bless again, that would be A-Okay). I enjoy finding other bloggers that are moms of many. My oldest was also born in 2002 and my youngest Aug. of 2016. Can’t believe my last baby is almost one. Looking forward to reading more on your blog. I have seen some of your youtube videos and then found you here. Love your family! We have 7 ourselves and homestead in Texas. Nice to meet u! Nice to “meet” you! I have a brother that lives in Austin, TX! Hi Nicci, I’m so thankful to God that you have this blog and your video blog. Thank you for putting in the time and effort it takes to keep up with all of this. I don’t know what lead you to be online in this capacity, but I’m glad you decided to. I’m struggling with my 5, 2, and 6 month old. I’m so unorganized and living in a small, craftsmen style home in Iowa. It’s really not big enough for raising a family of 5. Not to mention the clutter and lack of time to get organized… but I remember in one of your videos you mentioned getting things organized after baby number 4 maybe? So my question is, what changes did you make or what tips do you have for getting a handle on things? Getting organized. Thanks. Your kiddos are too cute! I’d love to chat with you about sending your family our newest faith based books and Bibles for your reviews or to see if you might recommend as homeschool curriculum supplements. Please feel free to contact me any time! Hello, I just found your channel on YouTube and I am amazed at how you do it all. I am looking at your video on scheduling to help me with mine. I too homeschool my 3 children and my niece. 17, 7, 6, 5. We follow an online school that is pretty much set up but I’m trying to work with that schedule to coincide with mine. How do you do it all with such grace and patience? When do you go food shopping? Do you work out? Please help! Keep doing what your doing. You are very blessed. I LOVE this. We keep saying we are done… But now have 6. I love your channel and blog. So much it inspired me to start my own. Nicci, your family is so cute and your story is so similar to mine. I also grew up in the Midwest (suburb of St. Louis, MO). I met my husband the first day of my freshman year of college, in Cleveland, TN. We got married when we were both 20. I thought we would wait awhile to have kids, at least until we finished school, but we found it 5 months later that our first little blessing was on his way. Two years later, only two weeks after college graduation, our oldest daughter was born. We went on to have two more girls over the next 2 1/2 years. While I was pregnant with our fourth, my husband had a vastectomy. His was successful, but we both began feeling that we didn’t really include God in that decision and felt like he was calling us to let Him decide the size of our family. My husband had it reversed in March of 2011, and six weeks later we found out that baby #5 was on the way. I am currently pregnant with baby #8 who is due to arrive on Christmas Day! That brings our total to 2 boys and 6 girls!! Congrats on baby Cyprus. He is so precious! I love all your blogs and you tube videos.I love you guys story.I ts very similar to mine and my husband’s. He was a senior and I a freshman when we first met. We didn’t begin a relationship (for a few reasons) til 2005. Our life was a wirl wind. I graduated in January 07 , we got married in May 07 and found out we were expecting that October and welcomed our first son in July 08. We now have three boys. We want more but don’t have much support from family. Everyone says were crazy and some go as far to say were stupid and ain’t thinking straight. I was wondering financially wise how do u guys do it? Wow your story is amazing! My husband and I are both 28. We have 4 children ages dd5, dd4, dd2, & ds4 months. I told my husband about you and your beautiful family and I got a weary laugh. LOL! I just can’t see not having more kids but at the same time we feel the weight of the responsibility. We too considered a vasectomy this year but those plans fell through thanks to God and his amazing plans. We are now a practicing NFP marriage! His was cut, a section removed and stitched (although I am not sure what material they stitched it with). Our situation is very rare but it CAN happen and does occasionally. Best wishes for your family! Hello Nicci! Love all of your posts and I always think of questions to ask you and then I realize they are too personal to ask in blog posts or Instagram! My hubby and I would love to have a big family, are both Christians and realize that God’s plan is bigger than ours (and then still try to have our own plan, lol), but we are looking at the cost of insurance, food, and living in general for even a family of 5 and it almost seems impossible! Do you have any words of encouragement or big things that have helped you guys figure it all out? Love your channel! I was just watching your video on family curriculum for 2015-2016 and wanted to comment but I don’t have a google/youtube account. I am curious what methods you use for memorization? I am currently schooling 2 children. I have one who is great at memorization and one who struggles a bit. I’ve been looking for sort of a structured or step by step formula that works for memorization….if such a thing exists? Just found you. So refreshing and exciting. I have 5 precious boys ages 7, 5, 3, 2 & 6 months. I would LOVE to see your daily schedule. Can you post it or e-mail it to me? I recently found your you tube channel and really enjoy it! So good to see a Christian family and you make me want to live on a farm lol God Bless You. Love this story of how God designed your family! We recently found out we are expecting baby #6 and wow! It’s so encouraging to see that a large family can be so blessed and happy! Not everyone is celebrating the news with us, as I’d like, but I know God has a perfect plan! Thanks for sharing your story. Blessings to your family! I Just wanted to tell you that I love watching your vlogs. They have given me the ability to realize much grace is needed when doing everything. Also a Christian Homeschooler of 5 littles under 6. You have given me so much home that it can be done with God’s help and it’s okay if you didn’t get to everything. Lately your “workout after baby” vlogs have helped so much. Thank you again for all of your inspiration. Just wanted to say I’ve been watching your youtube channel a while now and totally love it! We welcomed our 4TH in September 2015 and your vlogs entertained me through my pregnancy……we are a God fearing homeschooling family just as you guys are;) ……….much love from North Carolina! Been following you for awhile and knew the story but what a great retelling of it! God has surely blessed you. I found you through a youtube food budgeting video (I think that is the one I first watched). I am glad to find another family of 9. Will enjoy reading your blog and watching the videos. Hi, I was trying to locate your email to see if I could send you a copy of my grandfather’s book “The Stewardship of Homeschooling” to read and review on your blog. I couldn’t find one so I decided to leave a comment instead. Your kids are adorable! I have three boys right now and my husband and I have been on and off the fence about whether to keep our family small or have six! Every time I see a big family I think what if they hadn’t had more? They wouldn’t have that sweet little person in their family! Anyway, the book is by William Overton PHD, and is available on Amazon. It’s full of success stories from families who homeschool and is a good motivator for anyone wanting to do any level of teaching in the home to their children. I could also send you an extra to do a follower giveaways of some sort. Just let me know if that would be of interest to you!